Will Adam Sandler accept the offer? 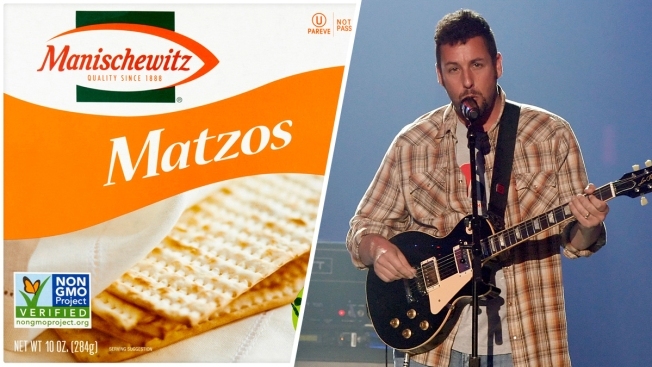 Manischewitz really wants Adam Sandler to write a Passover song, and the Jewish food giant says it's prepared a "suite" offer to get him inspired — a hotel room in New Jersey stacked with gefilte fish, matzo and other unleavened things to nosh. Not only that. The company offered to give Sandler its product free for life if he would once again put on his yarmulke and compose a follow-up to his hit Hanukkah song for Passover. The move prompted Manischewitz competitor Streit's to propose a possible counteroffer if Sandler was actually interested in such an endeavor. Manischewitz's food-for-song marketing stunt offer is "absolutely for real," according to Nicholas Gustaitis with the public relations firm BML. Gustaitis said Monday that a letter outlining the offer was sent to Sandler's representative and should have arrived this week. A photo from the "suite" Passover deal. "We know it got to their office building," he said. Sandler’s representative Cindy Guagenti said they haven’t received any correspondence from Manischewitz. She declined to comment on whether her client would consider crafting a Passover tune in return for a lifetime of seder staples. In Manischewitz's letter, President and CEO David Sugarman boasted his company's free hotel room was "not too shabby." 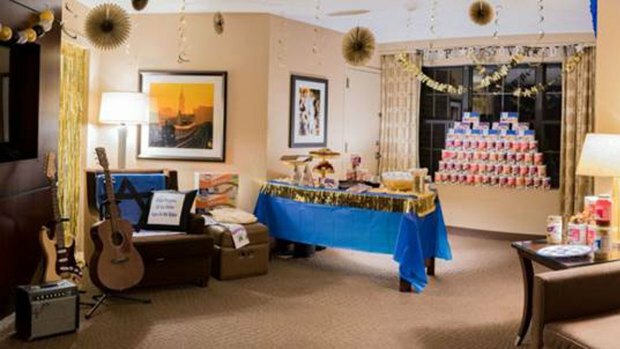 It's "fully equipped with musical equipment and packed with delicious Manischewitz products including our famous Matzo Ball soup, all the gefilte fish you can eat and plenty of matzo." Manischewitz's classic wines are not part of the offer, Gustaitis said. The hotel room in Parsippany would probably be available as long as Sandler needed it, should he get writer's block. He'd also have a "fairly short commute into New York City," Gustaitis said. Passover is celebrated this year from sundown on March 30 through April 7. According to Jewish tradition, families eat unleavened bread called matzo during the holiday to remember that their ancestors did not have time for their bread to rise when the ancient Israelites fled slavery in Egypt. Matzo is also called the bread of affliction. How many boxes of matzo constitute a lifetime supply? Gustaitis said he'd have to look into that. Of course, Manischewitz is not the only Jewish food king that makes matzo and other Kosher food for the holiday. There's also Streit's, which is based in Orangeburg, New York. Turns out they want in, too. A Streit's representative said that Sandler should take into consideration that their matzo tops the rest. "If Adam Sandler is interested in doing a Passover song, we suggest he talks to us first," said Alan Adler, great-grandson of the company's founder. Adler runs Streit's with his cousins. "We are the only major matzo company making matzo in America and we are still family owned and operated five generations later," he said in a statement. "He will get better matzo from Streit’s than our competition." Neither gambit seemed likely to score anything more than free publicity for the matzo makers. Asked if they'd have someone else in mind for a parody, perhaps Weird Al, Adler noted that they sponsored their own "20 Things to Do With Matzah" tune and video 10 years ago.